Are your sewer funnels moving down from root invasion, missing channel floors, or broken sewer channels? If you are experiencing these problems, then it is time you use the effective Trenchless sewer pipe repair. It is dangerous to breathe the sewer gas (Hydrogen sulfide) from broken sewers at home or workplace thus the need for taking immediate action. The Trenchless sewer repair in Topeka administered by the Topeka Pipe Lining Company has served for over 100 years, and thus they have adequate experience in repairing and replacing damaged plumbing systems, pipe clogging and installing backups. The Trenchless sewer repair is done through the Cured-in-place pipe (CIPP) process. It’s the most effective method for repairing underground sewer pipes without necessarily digging up or damaging the landscape. We are efficient in repairing collapsed and broken pipes, blockages, corrosion, bellied pipes and the removal of roots in sewer lines, to keep a plumbing system in good condition. At first, a camera is run through pipelines to examine and evaluate the source of the problem, thereby providing a visual presentation of pipe damages. This helps our sewer professionals to search for the best and affordable plumbing system repair or replacement of the damaged pipes. The entire process takes few hours inclusive of procedures such as inspection, installation, testing and curing. The Trenchless sewer repair involves installing new pipes inside the old pipe to prevent leakages without having necessarily to dig up or remove the floor concrete. Due to the existence of the numerous pipelining units enabled by the Perma-Liner equipment and the modern line technology, the Trenchless sewer repair process is very fast and reliable. 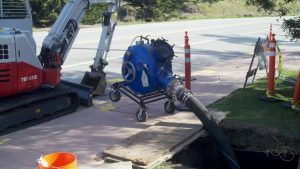 It is attractive to hire the Topeka Lining Company to carry out the Trenchless sewer repair in case of occurrence of damage because they do not require a downtime costs to facilitate the operation, thereby allowing smooth continuation of the repair and replacement processes of plumbing systems at no economic loss. The issue of vacating your premises to pave way for repair sounds like a thing many people consider a nightmare. With us, this is not necessary; imagine a process that doesn’t tamper with your productivity; sitting in your office or home while repair continues. Much better yet, you don’t have to do cleaning up after pipe relining is complete. With Trenchless sewer, there is no messing up with either the inside of the involved apartments, walls, factories, commercial buildings or hospitals. The process is considered to be of increased cleanliness to the surrounding environment, a reason you should make then your number one priority. With the preference of Trenchless sewer repair, you get to enjoy an increased speed in fixing broken pipes and backing ups, which takes only a few hours instead of weeks. Repairing a Trenchless sewer takes approximately 3hours with a 50 years warranty. When compared to the other processes, which involves digging and replacing pipes, the Trenchless sewer repair is destruction-free because no basements, floors, driveways, or walls are damaged in the process. It utilizes modern technology that doesn’t go to the extent of digging out pipes. For people living in Topeka, it has been made easier to find a professional sewer repair who can fix your leaking sewer pipes right away. For you seeking the most benevolent Trenchless sewer repair or replacement, do not hesitate to contact the Topeka Pipe Lining Company to cure all your piping needs. Our company guarantees all clients of a quick, efficient and up to date technology in pipes repair, we don’t boost, but our confidence and experience say one thing; we are up to exceed your expectations. I highly recommend Ryan, and Smith Plumbing! They are very reliable and efficient! I wouldn't use anyone else!